Naval battles have inspired countless films and television dramas over the years, recounting the bravery and tragedy that have unfolded over centuries of conflict on the high seas. From the author of Planes on Film and Battles on Screen , this book examines some of the most exciting features that have dealt with naval warfare, exploring the ways in which they have achieved critical success and enduring popularity with audiences. Victories at Sea considers the many different aspects of warfare on (and below) the waves as they have been depicted on screen, discussing such topics as amphibious operations, carrier warfare, underwater sabotage, and Cold War strategies. Covering films ranging from vintage World War II classics to modern seaborne thrillers, the book investigates the real-life stories which lay behind the production of these features as well as how they eventually came to be received at the box-office. 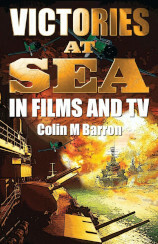 From blockbuster Hollywood epics to must-see television series, Victories at Sea is a comprehensive guide to the greats of the genre, combining a forensic eye for detail with meticulous analysis of the features under discussion. With discussion of low-budget dramas and high-octane action movies alike, this examination of naval warfare on the big and small screens relates all of the exhilaration and gallantry that have made these films such lasting favourites amongst cinema and TV aficionados. Published 28th September 2018 by Extremis Publishing. Destroy the Saucers — or die! They called them Haunebu. Flying saucers which can travel at 5,000 miles an hour and win the war for Nazi Germany. In a desperate bid to destroy them, Churchill sends a crack commando team to Germany. Their mission — destroy the Haunebu in their underground hangar whatever the cost in human lives! The team are joined by an RAF pilot who has a tragic past. And there is a traitor in their ranks! 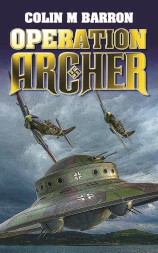 Operation Archer is an exciting war thriller in the style of Where Eagles Dare and The Guns of Navarone . Packed with action, it takes the reader on a rollercoaster ride of excitement and danger which never lets up. Published 10th September 2018 by New Generation Publishing. Dr Colin M. Barron has had a lifelong interest in hypnosis. After graduating in Medicine from Glasgow University in 1979, he worked in the NHS for a few years and was then the business manager of a private nursing home from 1985 to 1999. 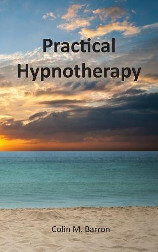 From 1999 until 2016 he was a hypnotherapist and, in this comprehensive book, he explains what hypnosis can be used for and how it can be integrated with other techniques such as TFT and NLP. The book will be of interest to practising hypnotherapists , doctors, dentists, psychologists, anyone contemplating a career in hypnotherapy and even members of the general public wishing to know more about the technique. Published 29th January 2018 by New Generation Publishing. 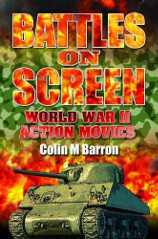 From the author of Planes on Film , Battles on Screen offers both an analysis and celebration of cinema's engagement with World War II, discussing the actors, the locations, the vehicles and the production teams responsible for bringing these epics to life. Reaching across the decades, the impact and effectiveness of many classic war films are examined in detail, complete with full listings of their cast and crew. Published 30th November 2017 by Extremis Publishing. When Colin Barron and Vivien Thompson first met, it was love at first sight. Both were forty-two, had attended Glasgow University, and shared many interests. In 2002, the couple married. Colin had a dream job as a self-employed hypnotherapist while Vivien worked as a learning-support teacher. They had a blissful marriage based on mutual respect and intellectual parity. Then in May 2011, Vivien collapsed at home with a massive stroke caused by a heart tumour that the NHS had failed to diagnose. Though her life was saved by a brilliant cardiac surgeon, Vivien was left with severe disabilities, little speech, and partial blindness. Her husband realized that the tragedy had been caused by inadequate investigation and helped Vivien claim compensation. Just after the case was settled in 2015, Colin himself had a massive heart attack and nearly died three times. Miraculously, he survived. 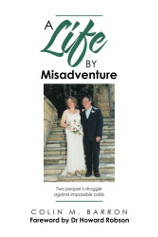 A Life by Misadventure is a story of two people's struggle against impossible odds. It is also a great love story, a tale of a love between two people, which would not die. Instead of dying, the love actually got stronger. Published 16th October 2017 by AuthorHouseUK. The 1980s were a golden age for action movies, with the genre proving popular at the box-office as never before. Across the world, stars such as Sylvester Stallone, Arnold Schwarzenegger and Bruce Willis were becoming household names as a result of their appearances in some of the best-known films of the decade. But what were the stories which lay behind the making of these movies? Why were the eighties to bear witness to so many truly iconic action features? And who were the people who brought these legends of action cinema to life? 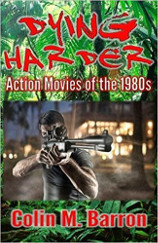 In Dying Harder: Action Movies of the 1980s , Colin M. Barron considers some of the most unforgettable movies of the decade, exploring the reasons behind their success and assessing the extent of their enduring acclaim amongst audiences which continues into the present day. Published 31st May 2017 by Extremis Publishing. In Planes on Film Colin M. Barron reveals many little-known facts about the making of several aviation epics. Every movie is discussed in comprehensive detail, including a thorough analysis of the action and a complete listing of all the aircraft involved. With information about where the various planes were obtained from and their current location, the book also explores the subject of aviation films which were proposed but ultimately never saw the light of day. With illustrations and meticulous factual commentary, Planes on Film is a book which will appeal to aviation enthusiasts, military historians and anyone who has an interest in cinema. 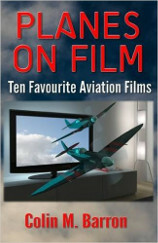 Written by an author with a lifelong passion for aircraft and their depiction on the silver screen, Planes on Film presents a lively and thought-provoking discourse on a carefully-chosen selection of movies which have been drawn from right across the history of this fascinating cinematic genre. Published 30th September 2016 by Extremis Publishing. Dr. Colin M. Barron has delivered hundreds of lectures and presentations to audiences during a long career, giving speeches on a wide variety of different subjects over many years. 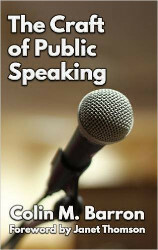 In The Craft of Public Speaking , he shares the essential knowledge that you will need to become a truly successful public speaker. Published 30th June 2016 by Extremis Publishing.